The University of California, Irvine (UCI, UC Irvine, or Irvine), is a public research university located in Irvine, California, United States, and one of the 10 campuses in the University of California (UC) system. UC Irvine is considered a Public Ivy and offers 80 undergraduate degrees and 98 graduate and professional degrees. The university is designated as having very high research activity in the Carnegie Classification of Institutions of Higher Education, and in fiscal year 2013 had $348 million in research and development expenditures according to the National Science Foundation. UC Irvine became a member of the Association of American Universities in 1996, and is the youngest university to hold membership. The university also administers the UC Irvine Medical Center, a large teaching hospital in Orange, and its affiliated health sciences system; the University of California, Irvine, Arboretum; and a portion of the University of California Natural Reserve System. UCI was one of three new UC campuses established in the 1960s to accommodate growing enrollments across the UC system. 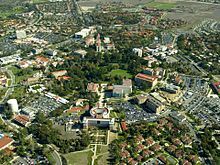 A site in Orange County was identified in 1959, and in the following year the Irvine Company sold the University of California 1,000 acres (400 ha) of land for one dollar to establish the new campus. President Lyndon B. Johnson dedicated the campus in 1964. The UC Irvine Anteaters compete in 18 men's and women's sports in the NCAA Division I as members of the Big West Conference and the Mountain Pacific Sports Federation. The Anteaters have won 28 national championships in nine different team sports, 64 Anteaters have won individual national championships, and 53 Anteaters have competed in the Olympics. The University of California, Irvine was one of three new University of California campuses established in the 1960s under the California Master Plan for Higher Education with the San Diego and Santa Cruz campuses. During the 1950s, the University of California saw the need for the new campuses to handle both the large number of college-bound World War II veterans (largely due to the G. I. Bill) and the expected increase in enrollment from the post-war baby boom. One of the new campuses was to be in the Los Angeles area; the location selected was Irvine Ranch, an area of agricultural land bisecting Orange County from north to south. This site was chosen to accommodate the county's growing population, complement the growth of nearby UCLA and UC Riverside, and allow for the construction of a master planned community in the surrounding area. What are the academic rankings for University of California-Irvine? 1. number 108 for Academics. 2. number 162 for ROI (Return on Investment). 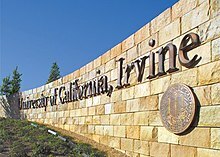 What universities are similar to University of California-Irvine?